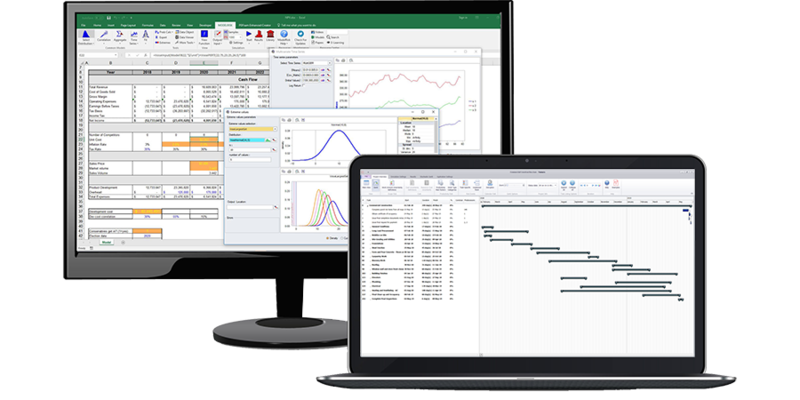 Simulation software offers the facility to divide a histogram plot into up to three areas by using delimiters. In this example, the user has defined the lower limit as the 5% mark, and the upper limit as the 95% mark. This approach is useful if your organization consistently requires only two percentiles in a risk analysis model, and one could then dispense with showing a cumulative plot as well. Let's say in this example, the distribution is the estimated cost of a project in $10^5. Perhaps one has a budget of $2,350,000 and a reserve of an extra $500,000. The histogram shows that you have approximately an 85% probability of being under budget, and about a 99% probability that your budget + contingency would cover the total project cost.